The Scierra Fusiontech Wading Jacket is the ultimate jacket when it comes to value for money. It features a durable 100% polyester shell fabric with a water resistant finish. It has a 3-layer construction with taped seams for maximum leak protection and 8mm TPU lamination remaining high breathability while being fully waterproof. The jacket includes a large high-quality front zipper with a wind fillet to prevent gusts and spray sneaking through the teeth of the zip. The jacket provides plenty of room for safe and secure storage with two large water-resistant zipped chest pockets to store your gear with cosy fleece-lined hand-warmer pockets sitting behind them. It also has a large expandable back pocket and features a laser-cut water-resistant pocket for storing tips and leaders etc. 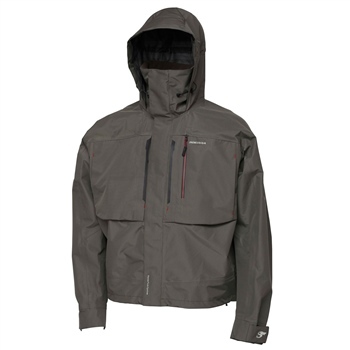 The Fusiontech Wading Jacket leaves lots of room for adjustability. It has wide outer cuffs with a Velcro adjustment along with an adjustable hood and hem. The Scierra Fusiontech Wading Jacket is an excellent addition to any angler's arsenal and is available in a variety of sizes that you can choose from using our drop-down menu.